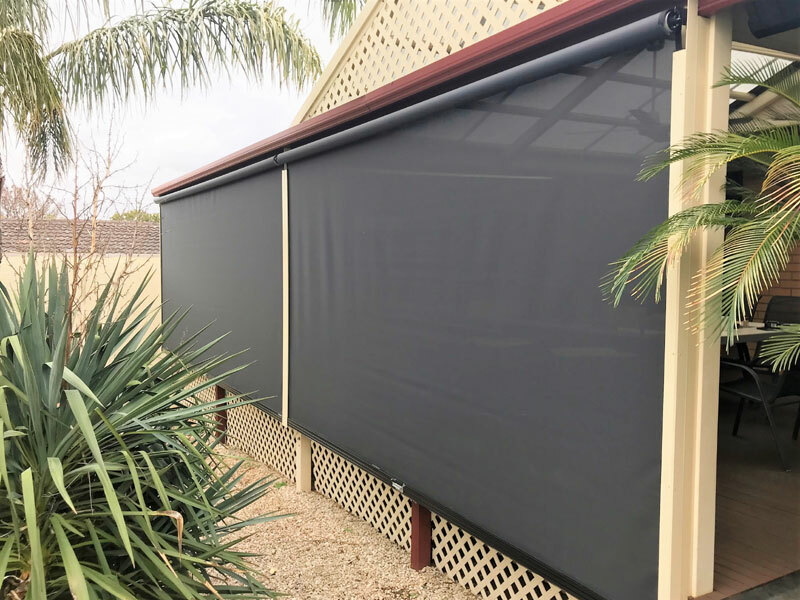 Use your outdoor area year-round with our extensive range of high quality outdoor blinds, perfect to protect your alfresco, veranda, pergola or balcony from the elements, so you can enjoy the great Adelaide outdoors. You are sure to find your perfect outdoor blinds at Open’N’Shut as we offer an extensive range of quality products from the best brands such as ZipTrack, ZipScreen and Slidetrack. We have outdoor blinds to suit all budgets and they come in a fabulous range of materials, finishes and colours. Click here to see examples of our fabulous outdoor blinds range. Our friendly consultants will bring the showroom to you, measure up and advise you on the best outdoor blinds to suit your needs. With over 20 years in the industry they are happy to advise you on how to create your dream outdoor space and can even advise you on the best colours to match and blend in with your home. Outdoor blinds are known by many names including alfresco blinds, pergola blinds, veranda blinds and bistro blinds. They add a touch of style to your entertaining area whilst adding value and versatility to your home! No matter how large your entertaining area, we can provide a solution, offering outdoor blinds in widths of up to 6.6m wide or 21 square meters in total. 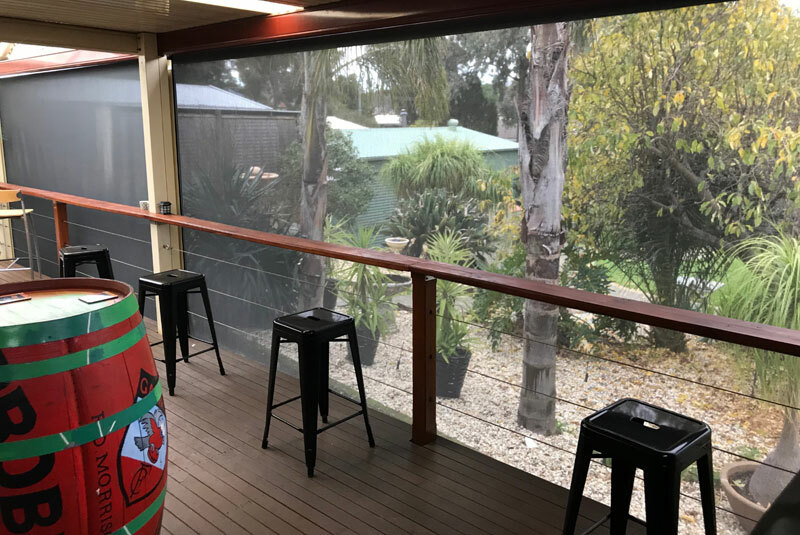 As well as being a fabulous investment in your home, alfresco blinds allow you to relax and unwind outside in real comfort, being shaded from the intense Adelaide heat, protected from the wind, rain and flying insects. All this without losing your view or connection to the outside. Our outdoor blinds, also known as alfresco blinds or bistro blinds create a real contemporary feel, with no chains, winders, pulleys or straps they seamlessly blend into your entertaining space. They are spring loaded for simple and easy operation, with a super smooth gliding action. As the fabric is held inside a channel there is minimum movement and no noisy flapping. 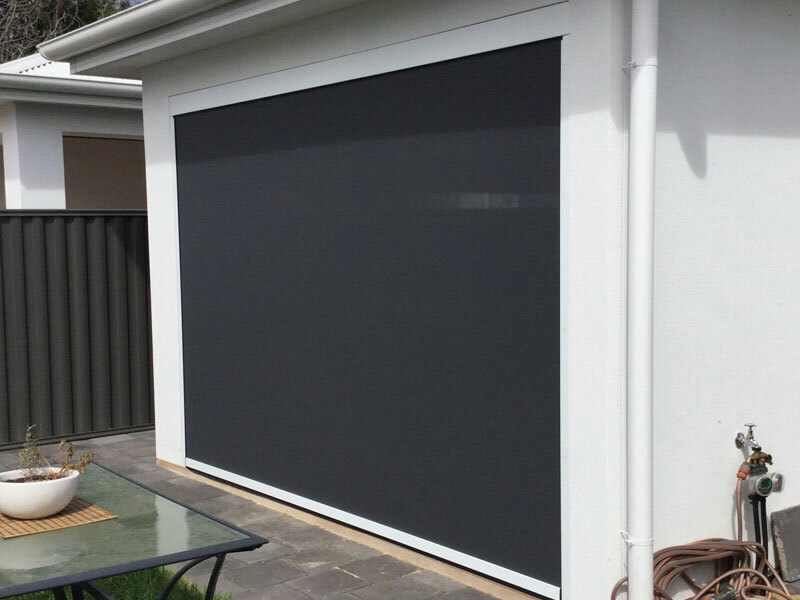 Simply pull the alfresco blind up, down or stop at any position in between. For added luxury and the ultimate in convenience, we can install motorised blinds with simple push-button operation. With the advances in battery technology, we offer cost-effective motorisation with a battery-operated drive system or a more traditional mains power connection. Creating an awesome outdoor entertaining space is our specialty and you can rest assured that you are in good hands. We take care of everything, from the initial measure through to the final install and we are open 7 days a week for your convenience. Our reputation for offering quality outdoor blinds, great customer service and unbeatable prices is reflected by the number of 5* google reviews we have and you are always guaranteed Adelaide’s best prices. To make your purchase as easy as possible, we offer 50 months, no deposit, interest-free finance. 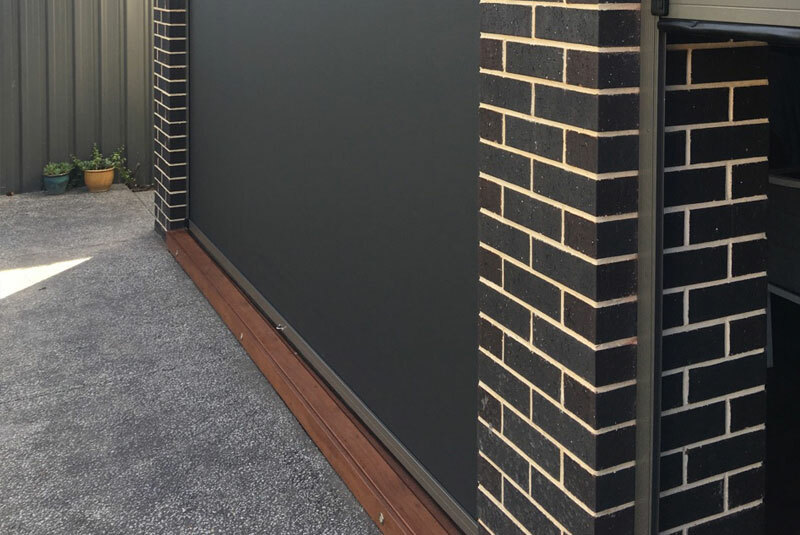 Our outdoor blinds are manufactured here in Adelaide so most of our products can be installed within 3 -5 business days and they all come with a 5-year peace of mind guarantee. Call us on 08 8250 5163 to transform your outdoor area! How long does a free measure and quote take? Your measure, design consultation and quote can take anywhere from half an hour to an hour depending on the size of your outdoor area and the level of advice you require. What is the difference between a Café blind, Alfresco Blind and a Bistro blind? Café Blinds, Alfresco blinds and Bistro Blinds are all just names which refer to blinds that can be used outside. Traditionally outdoor café blinds have been associated with PVC blinds, but outdoor café blinds, alfresco blinds or bistro blinds can be made from PVC, mesh or canvas and may also be known as patio blinds, veranda blinds or outdoor blinds. How do I know which outdoor blinds will be best suited to my outdoor area? Our friendly consultants will give you professional advice on how to select the blind best suited to your outdoor area. They will listen to your needs and ask questions to understand what you are trying to achieve (e.g. shade protection, privacy etc.). They will then, talk you through the different fabric options and its benefits, show you samples and discuss the different control options available so you can make an informed choice. Which is best for Outdoor blinds PVC or Mesh? PVC blinds are ideal when you want to provide a completely weatherproof seal to your outdoor area. They create a physical barrier to wind, rain and insects and can help keep the warmth in on cooler evenings. PVC blinds can be clear or tinted for added privacy. 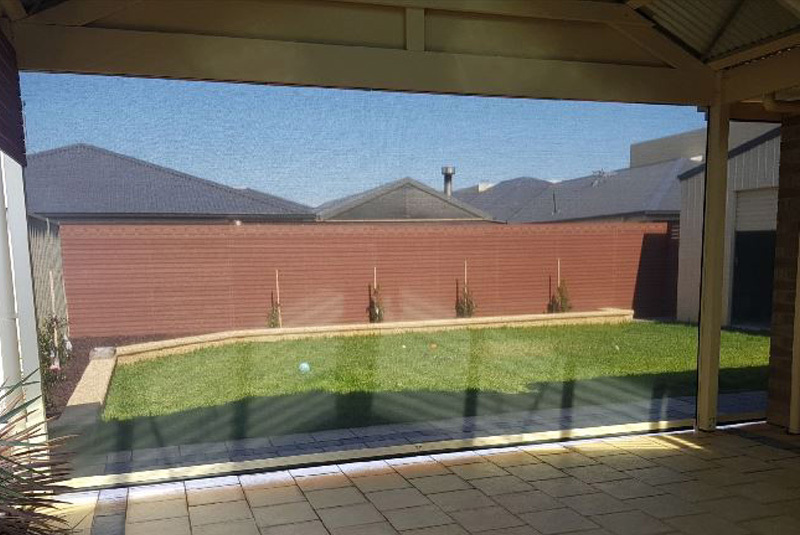 Mesh blinds are a great outdoor solution as they provide amazing protection from the wind, rain and insects, but also let the airflow so you can enjoy a cooling breeze. Mesh blinds come in a huge range of colours to compliment your exterior, and you can select from different types of weave with varying degrees of privacy. The tighter the weave of the fabric the higher the shade protection and privacy level. Our mesh fabrics are some of the most advanced technical fabrics around; they are built from a high tensile polymer to withstand the harsh Australian climate and give high abrasion resistance and durability. How do I operate my outdoor blinds? Open’N’Shut offers a range of control options. The most popular is our manual blind which is spring loaded for easy operation. Simply pull the blind to operate it and it will lock into place, it’s quick and easy, and requires very little force or strength. For the ultimate in luxury, we also offer a choice of remote control operations. Remote controls can be battery operated or hard-wired to the mains. Can I partially open my outdoor blinds? Yes, as we use the slidetrack system, you can have your blinds open, closed or anywhere in between to create the perfect environment. I have a large balcony that catches a lot of sun, can I use an outdoor blind? Yes, outdoor blinds are frequently used on balconies to prevent the harsh glare of the afternoon sun and make the balcony area more comfortable. My pergola is not 100% square can I still have outdoor blinds fitted? It’s surprising how many outdoor areas are not 100% square. Your blinds will always be fitted 100% straight, and any gaps at the top can be covered by flashing. Any gaps at the bottom are often masked with the use of a weather seal on the base rail. Do outdoor blinds look neat and tidy when its rolled up? Open’N’Shut only installs track guided outdoor blinds for a quality and durable finish. This system has no unsightly ropes or pulleys to give a neat finish with clean lines. We recommend having your blind installed in a housing which is a metal case which fully covers and houses the blind when rolled up. This creates a neat finish and offers superior year-round protection when the blind is not in use. I have a huge outdoor area, what is the widest outdoor blind I can have? 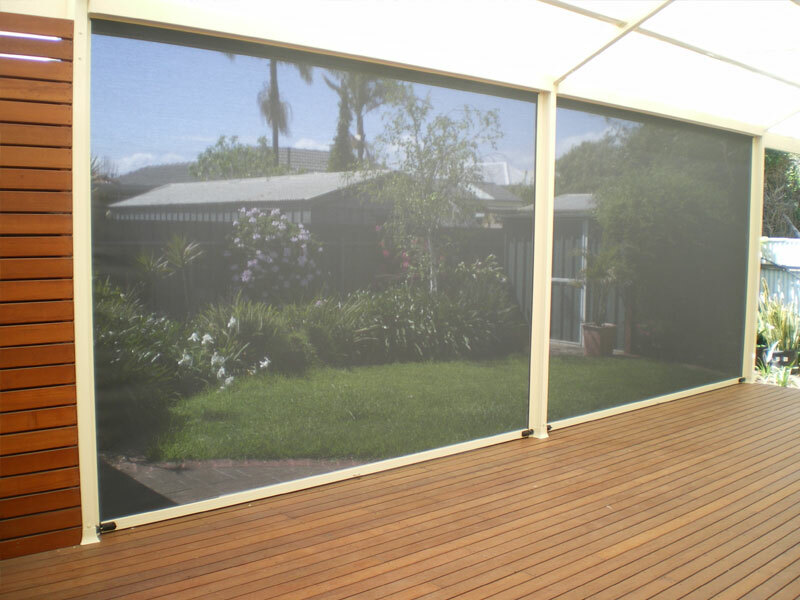 Our highly versatile outdoor blinds can span up to 6 meters in width to suit even the largest of entertaining areas. Where your outdoor area exceeds these widths, we can quickly and easily construct additional high strength pillars/posts to divide the area up into suitable sections to house your outdoor blinds. Are your blinds track guided? Yes, all our mesh and PVC outdoor blinds are fully enclosed by a vertical track on both sides. This allows for a high-quality installation, provides a seal against the wind and insects and prevents the blinds from flapping in the wind. Do your outdoor blinds come with a guarantee? Yes, all our blinds come with a five year warranty covering parts and labour. Do I need to do anything to get ready for installation? There is no need to make any preparations; we take care of everything from the initial measure right through to the installation, all we ask is for clear access to the area. How soon can you install my outdoor blinds? We can install your outdoor blinds within two weeks of your free measure and quote or within 2 weeks of you accepting our quotation. How long will my outdoor blinds take to install? Installation times will vary depending on how many outdoor blinds are being fitted and the type of operation eg. manual or mains connected. However, as a rule of thumb, it takes between 1 ½ to 2 hours to install each blind. Provided we have access to your outdoor area you will not need to be home for us to install your outdoor blinds. We always give you an installation time and our installers can call you about half an hour before they arrive if required. How do I clean my outdoor blinds? PVC blinds generally require more maintenance than mesh blinds because just like windows they tend to show the dirt. PVC blinds should be rinsed down with a hose before cleaning in order to rinse off any dirt or debris that could scratch the blind. Once the blind has been rinsed down, it can be cleaned with a soft cloth using a very mild soapy solution. Dishwashing detergent is fine but only use a small amount well diluted with water. The surface of PVC is porous so can be prone to scratches. Do not use a brush to clean PVC blinds as this may scratch the surface of the PVC. Once you have cleaned the blind give it a final rinse with clean water and then for the ultimate finish, dry with a chamois cloth. Always allow the blind to dry before rolling it up to prevent moisture being trapped inside the layers of the rolled-up blind. Mesh outdoor blinds are less sensitive to cleaning than PVC blinds. Our Mesh blinds are manufactured using a high tensile polymer which has very high abrasion resistance making them less susceptible to scratching and damage during cleaning. Mesh outdoor blinds can be cleaned using a soft cloth or sponge and cold soapy water (dishwashing liquid is fine). Rinse the blind after cleaning and allow to dry. Never roll a mesh blind up when still wet as this can trap water between the layers of fabric which may cause damage over the long term. Clean bird droppings off any outdoor blinds as soon as possible. Some bird droppings contain chemicals which may damage the blind. Never use a pressure washer to clean outdoor blinds as this can result in damage or sagging. Always allow the blind to dry before rolling it up to prevent moisture from being trapped inside the layers of the blind.